Ask any digital artist about their tools, and Wacom’s products inevitably come up: The company is famous for its pressure-sensitive drawing tablets and digital monitors. But when it comes to mobile technology, Wacom has been strangely wary of jumping into the fray, choosing instead to license its technology to third-party tablet computer makers. Even its iPad styluses were bereft of the pressure-sensitive technology the company is famous for. But all that is changing: On Monday, Wacom announced that it would be producing both a pressure-sensitive iPad stylus and its own custom tablet solution. Wacom’s Intuos Creative Stylus joins the ranks of the Wacom Bamboo Stylus line, and is the company’s first pressure-sensitive iPad stylus. Given that the iPad doesn’t currently offer a pressure-sensitive display, the stylus incorporates both Bluetooth 4.0 technology and third-party app support to perform its wizardry; in this, it follows a similar path first set by fellow stylus-makers Adonit and Ten One Design. The company boasts 2048 levels of pressure-sensitivity in compatible apps, along with palm-rejection technology. At launch, the Intuos stylus will support Wacom’s own Bamboo Paper app, along with SketchBook, ArtRage, ProCreate, ArtStudio, Inkist, and Flipink, with support coming soon for Adobe Ideas, Psykopaint, and Vision Object Notes. Design-wise, it combines Wacom's traditional two-button interface and rubber grip with the 6mm rubber nib of the company's original iPad model. It’s powered by a AAAA battery (Wacom brags that one will power the stylus for over 150 hours), and ships with a case, two spare nibs, and a spare battery. The Intuos Creative Stylus will work with the iPad 3 or later. If you’re itching to pick one up already, you’ll unfortunately have to wait a few months—the $99 Intuos Creative Stylus won’t be available until October 7, but you can pre-order one in black or blue. The company’s second announcement may be more appealing to artists who have held off on purchasing an iPad for its lack of pressure-sensitive screen: Wacom’s Cintiq Companion tablet line offers a full multi-touch pressure-sensitive tablet experience. 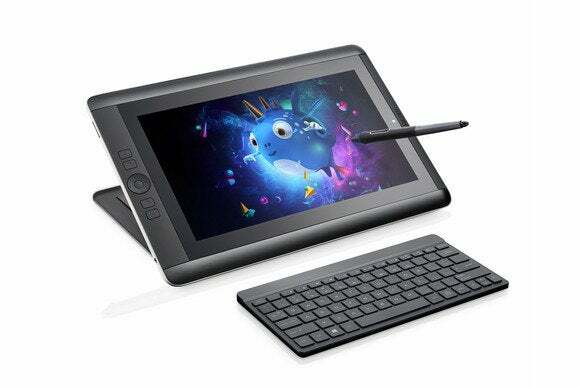 The company has two models available: a Windows 8 tablet, and the Companion Hybrid, which works as a standard Cintiq when plugged into a Mac or PC, but also as a stand-alone Android tablet with basic sketch tools built in. On the surface, they look identical to Wacom’s Cintiq 13HD, but both offer full multitouch—a feature the 13HD lacks—along with 2048 levels of Wacom’s patented pen pressure-sensitivity and tilt recognition. The Cintiq Companion has access to all the ExpressKeys and radial dials present on Wacom's other Cintiq models. The Companion Hybrid is a little less fancy under-the-hood than its Windows 8 companion; when not being used as a display on the Mac, it runs Android 4.2 Jelly Bean on a Nvidia Tegra 4 processor. Nor does it have access to Photoshop—instead, the tablet comes with Wacom’s new Creative Canvas software for doodling and painting on the go, along with ASTRO File Manager for sending rough images over to your computer. But you’ll still be able to use the tablet as a fully-functional Cintiq monitor when not on the road, so you'll never be too far from a professional drawing program. Sadly, it looks like you still need a power source when using the tablet as a display. Both models also have a few extra tablet features, including Wi-Fi, Bluetooth (4.0 for the Cintiq Companion and 3.0 for the Companion Hybrid), 2-megapixel front cameras and 8-megapixel rear cameras, a stereo headset jack, and microphone. If you were hoping the Cintiq Companion might compete with the iPad on price, however, the Windows 8 tablet leans more toward the cost of a laptop than a tablet: the 256GB model will retail in September for $1999, while the 512GB model is priced at $2499. The Companion Hybrid is a little more reasonable for tablet artists: It’s priced at $1499 for the 16GB model; an extra $100 will buy you 32GB total space. It’s still not easy money, but for serious digital painters, it may be worth it: You’re essentially paying for a tablet with a Cintiq 13HD glommed on, after all. 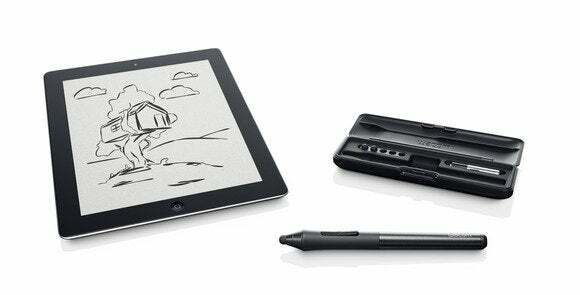 Both models will be available in mid-September from Wacom’s store.